If given the opportunity, always cook scallops. For the Quickfire challenge, we got to see Rule #3 in action. In the history of the show, I can’t recall an instance when scallops didn’t wow the judges, and I’m starting to think that it’s not mere coincidence. Is it possible that only the best chefs—or the middling at their most inspired—just happened to tackle scallops or is it such an irresistibly delicious foodstuff that it stands up to even the most pedestrian preparation? Whatever the case, only Jennifer made scallops for the Quickfire—which involved pairing food with beer—and she came away with her first victory after spending the first five weeks languishing in the middle of the pack. Could it be that her anger over Zoi’s departure somehow gave her dish a Like Water For Chocolate-esque kick, as she seemed to believe? Or is it that scallops are apparently unscrew-upable? I’m tentatively going for the latter. I wish I had more to say about the Quickfire, but it didn’t do much for me, perhaps because the guest judge (the head chef at a Chicago restaurant called Avec) was either too shy or too apathetic to talk about how the dishes did or did not pair well with the beer. I’m no expert, but if food and wine pairings can be talked about in some detail, then surely food and beer can, too. Why offer a choice of 16 different brews if it doesn’t really matter anyway? Many of the dishes looked great—I was particularly enamored of Stephanie’s mussels (which definitely go great with beer) and Richard’s no-nonsense grilled tuna (see haters, he can do simple too)—but the judging was haphazard, which in turn made the beer factor seem completely irrelevant. This week’s Elimination Challenge was as inevitable as it was satisfying: Grill some food for tailgating at a Bears game. After a string of group challenges, it was a relief to see the chefs take their fate entirely into their own hands. The only real twist is that the hoi polloi—not the judges—would be determining who would be in the top and bottom three. At first, I didn’t think this was a good idea, since you can’t necessarily trust the palates of beer-swilling yahoos, not to mention Bears greats like Gale Sayers, Richard Dent, and William “The Refrigerator” Perry, who probably spent their playing careers more concerned with the quantity rather than the quality of their diet. And yet, the “scorecards” seemed to land the right people in the right places, with the possible exception of Richard, whose veal and pork “pâté melt” struck me as a witty fusion of his sensibility and that of gameday burger lovers. 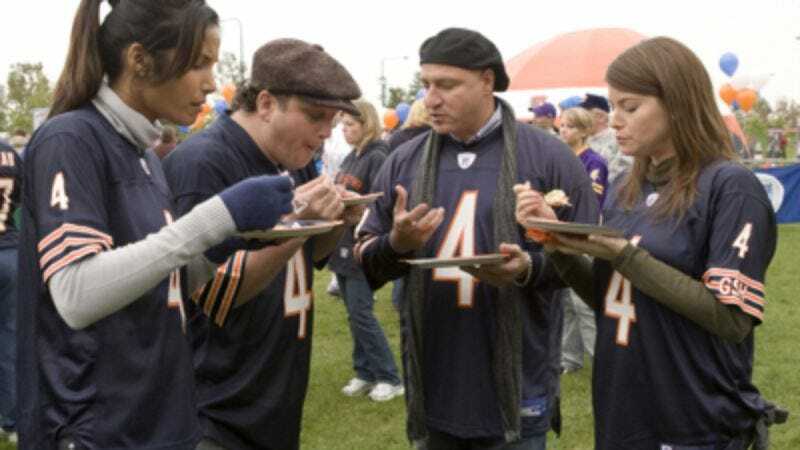 In any case, it turned out to be one of the season’s most entertaining challenges: Memorable highs and lows in the cooking, an amusing dynamic between the chefs and the Bears fans, and hilarious bits of color like Andrew wearing the football helmet (“I’m in the game!”) and Richard Dent asking, “Quinda tabouli? Is that safe?” Stephanie again lands in the Top Three with her pork tenderloin, securing her status as the quiet frontrunner. It’s looking like Antonia might be a strong contender, too, as her jerk chicken with banana and pineapple brought an island flair to the expected kicked-up grill food. Dale wins for his ribs, though he probably loses some Chicago fans with his Sammy Sosa reference, given the once-beloved Cub’s infamous and ignominious departure from the Windy City. Any one of the bottom three could have gone home tonight with no argument from me, though I’d give Mark a slight pass for being the only one to use a charcoal grill, which should have yielded a better result. I thought Nikki was a goner for sure, since she didn’t bother to encase her own sausages—a heresy of heresies in the city of Chicago. Her decision to include shrimp in the dish out of concern that she might run out of food was bizarre, too. Making sure you have enough grub to throw on the grill is the sort of practical thinking that might serve you well at backyard barbeques or family reunions, but it’s not what professional chefs are supposed to do. And then she runs out of peppers and onions anyway. Wha? Still, Ryan was the right choice to hit the bricks, because he managed to violate both Rule #1 and Rule #4 simultaneously. When you’re cooking for tailgaters at a Bears game, it doesn’t matter if you’re a self-described “metrosexual” who isn’t into football. And it’s both pretentious and condescending to think that you’re going to somehow transcend the rabble by serving them a five-course meal that has no place at a Midwestern sporting event. To Ryan, apparently nothing says “football” like poached pear and crème fraîche. For that reason, he’s been put out of his misery—and ours. • Andrew: “This is Chicago and I seriously doubt anyone here would not like bacon.” Amen to that, sir. Has any dish not been improved by the addition of bacon? • What’s with the interlude of Spike and Mark sharing a bubble bath together? Between that and last week’s strange coda, the show has been messing with the formula in really peculiar ways. • The best/worst poll question yet: Who would you most want to touch in touch football? That Tom wins resoundingly over Padma suggests that Bears fans aren’t limited to Soldier Field, if you catch my drift.